I haven't had a grand transformation with weight loss or gaining muscle. My appearance hasn't changed dramatically over the last few years, yet I'm physically very different. About 6 weeks ago, I stopped using an insulin pump and changed to multiple-daily-injections (MDI). I had used a pump for over 13 years (2 Medtronic pumps, then 2 Accu-Chek) with only one short pump break when I was living in Patagonia in late 2010. My pump was recently becoming more of a hindrance than a help and and I knew there was life beyond those mechanics that were attached to me. After I initially read Dr. Bernstein's Diabetes Solution book in January 2014, it took me an entire calendar year to even try the low carb way of eating. That whole year before I tried the plan, I could feel Dr. B's words whispering to me. The book made sense, but I was too scared to try. Then, after I tried low carb and saw the benefits of The Law of Small Numbers, it took me another 3 years to also get to this point and follow the recommendations for using Regular insulin (Actrapid in the EU). Now I ask myself, "Why on earth did I wait so long?" Ego. Independence. Thinking I knew better. It's not the first time that type of thinking has held me backI'm guessing that I'm not the only one. Now, every time I get dressed, I'm faced with a new-found and completely unexpected freedom. 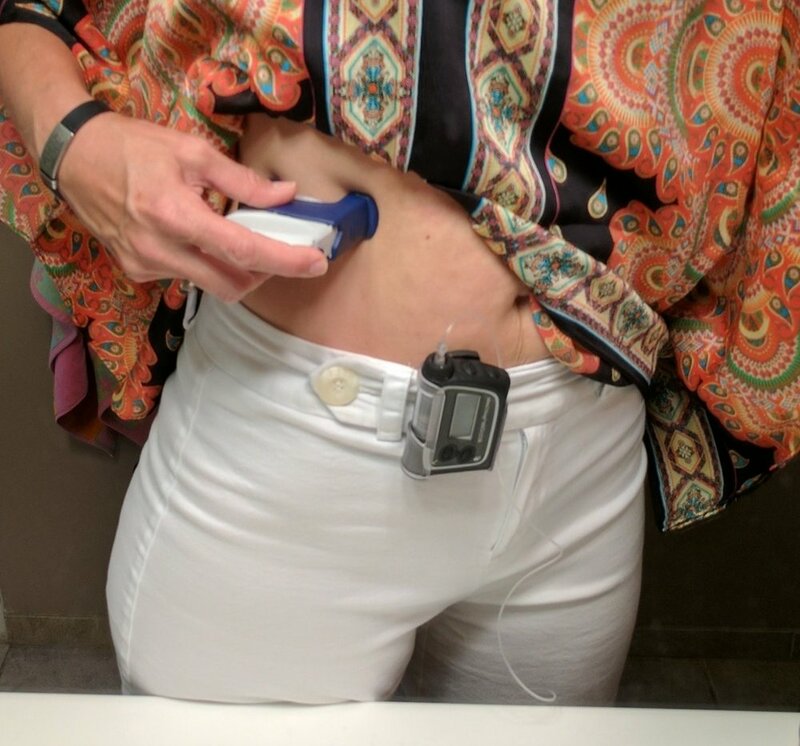 Wearing dresses is much easier without an insulin pump. My fitted jackets and tops are smoother without having to accommodate a blocky pump on my waistband. I'm more comfortable sleeping because I don't have to adjust my pump when rolling over. I don't have to worry about getting caught on tubing every time I use the bathroom. This new-found freedom is incredible. I feel as though I have a new and improved body! That is 9-10 injections per day. And yet, I feel more free than I have since before my diagnosis. Even though I'm still tweaking the dosages and timing of my insulin injections, my CGM lines are already comparable to when I was using the pump, and I don't have to chase delayed protein spikes anymore. For those of you who are saying, "What about Omnipod? That's a tubeless pump!" I've tried it. I'm sensitive to the adhesive and my skin blisters after just a few hours of it attached to me. I've researched various skin prep products that might help but right now, I'm happy to be pump-less. I'll still wear Dexcom very obviously on my arm and I'm willing to explain it to anyone and everyone who cares, but I'm happy to say goodbye to my pump. Thanks for your service, but we're going our separate ways. Low carb was the first game-changer in my life with diabetes; using Regular insulin injections has been the second. For more information about using Regular insulin for diabetes management, see Dr. Bernstein's Diabetes Solution book, Chapter 19, page 300-330. If you don't have Dr. Bernstein's book, you can find it here on Amazon. Have you used Regular (Actrapid) insulin or switched back to MDI from a pump? Tell us about your experiences in the comments below!